Spiral symbology is also present in the Double Spiral and Triple Spiral. Double Spirals represent dual purpose in life, the inward journey and the outward journey. A Double Spiral can also be seen in the yin-yang symbol. 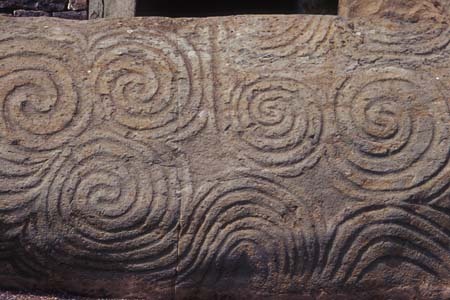 The Triple Spiral is believed to be an ancient goddess symbol. It can be thought to represent the Triple Goddess (maiden, mother, crone) or the goddess Brigid. The Triple Spiral is also used to represent the three realms of land, sea, and sky. Also known as Triskele, the Triple Spiral is seen at many ancient Irish Megalithic and Neolithic sites, such as at the Newgrange monument. Triskelions can also be seen in the flags of Sicily and the Isle of Man. The Celts believed that all things moved in eternal cycles, and the triple spiral reminds us of the cycle of life. Following anonymous clues and increasingly strong dream-visions, modern-day Kay travels to Ireland and enters the Bronze-Age. She and a De Danann foundling, Aherne, are charged with finding the lost treasures of the De Danaans. Ultimately, their quest will redeem the ancestors and reconcile warring invaders and settlers moral concerns that mirror modern ones. This was the book that started it all for me, peaking my interest in magic, adventure, and all things Celtic. 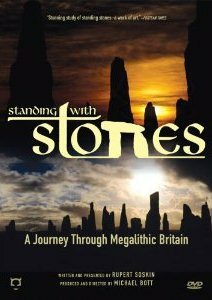 Imagine my surprise when I grew up and realized that much of what the author wrote about was from existing Celtic folklore and mythology, rather then a figment of her imagination (well, ok maybe a bit of figmental imagination thrown in). The Tuatha de Danann, the Fomorians, the Fir Bolg, Amergin, Eriu, and the four magical treasures; Dagda‘s Cauldron, the Spear of Lugh, the Sword of Nuada, and the Stone of Destiny… all from Celtic folklore. Even though I first read this book many, many years ago, I think its a great young adult book for children and adults alike. Definately my favourite from O.R. Melling. 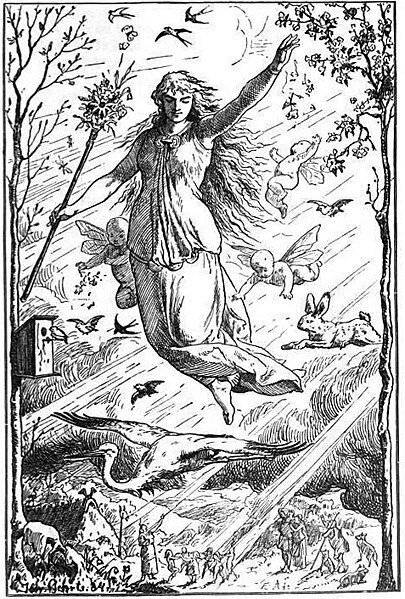 Ēostre (Ostara, Ēastre) is an obscure Germanic and Anglo-Saxon goddess of spring and dawn, and is thought to be the namesake of the Christian holiday Easter. Her festival is celebrated on the Vernal Equinox, the first day of Spring. The cleric Bede first described Ēostre in his book De Temporum Ratione in the 8th century. However, material related to her is so minimal that some scholars argue that she was never a goddess at all. Her name could have been derived from Ēosturmōnath, the Germanic name for the month of April. 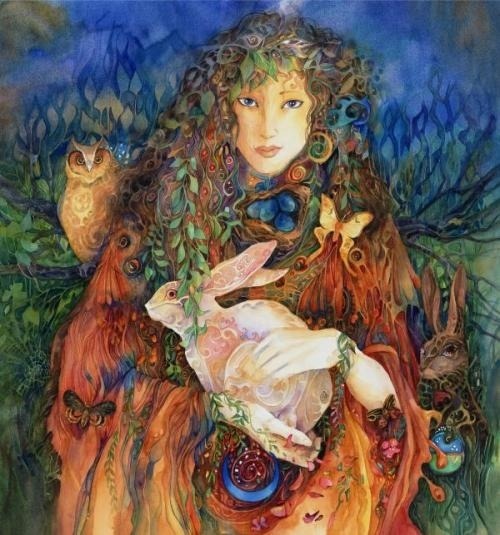 The High German word for Ēostre is Ostara. Through her association with dawn, Ēostre may be related to the Greek Eos, Roman Aurora, or Indian Ushas. 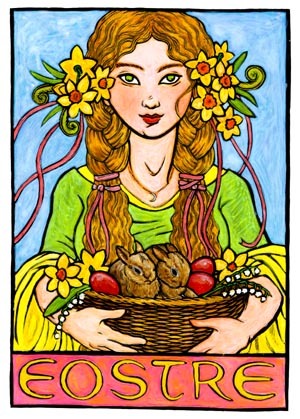 Ēostre is connected with growth, renewal, abundance, new beginnings and fertility. As symbols of rebirth and fertility, eggs and rabbits are sacred to her, as is the full moon. Ēostre represents the transitional time between childhood innocence and adult passion, and reminds us that life is full of untold possibilities and adventures.